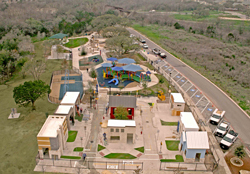 An overhead view of the park--it's huge! The best free outdoor park that we have ever visited just opened a few weeks ago in our city. This park is amazing! I call it a free, outdoor children's museum. We visited it first the Monday after it opened and knew we needed to bring some friends with us next time to experience it. 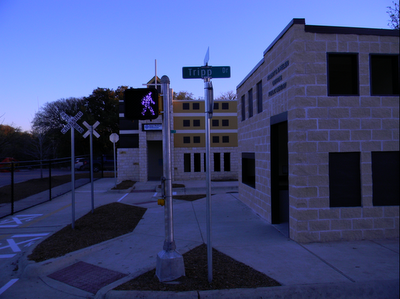 One of my favorite bloggers, Heidi of freefuninaustin.com, did an excellent write-up on it after her family visited it. Here is a link to that blog post. The park is massive (over 51,000 square feet of enclosed fun) and I can tell it will be an excellent place to visit this summer. The entire park is shaded so well with large live oaks and covered awnings. 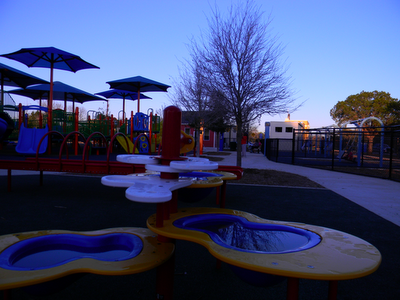 The park is a "Play for All Abilities" park and is like no other. A playscape with lots of ramps that Luke loves to run on! Luke loved running on these ramps. crawling through the rolling tunnel. Luke and I visited the fire station in the little village. We brought my brother, Jeremy, and his family (our sister-in-law, Brandy and nephew, Traber) to the park after they arrived to our house from Oklahoma this past Friday. We had a blast and the boys didn't want to leave. One of the things I LOVE about this park though is that it is completely fenced in. So, if they did want to leave, it would be difficult for them to do so on their own. These boys are fast, so we loved this safety feature as their parents. Luke liked "rocking out" on the bongo drums in the musical pod. Luke liked making this boat sway. Here is a larger photo of the boat that you can make "sway". Luke and Traber peek through a hole in a fun structure. Even us adults enjoyed these spinning chairs. Here, Traber is having fun on one. and Luke spun on the other one. This was one of my favorites--this chair rocks. My brother, Jeremy, enjoyed it too. 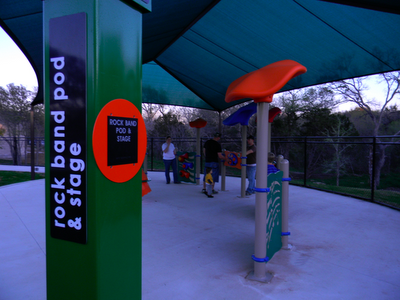 Here are a few more pictures of the park from the freefuninaustin.com blog. 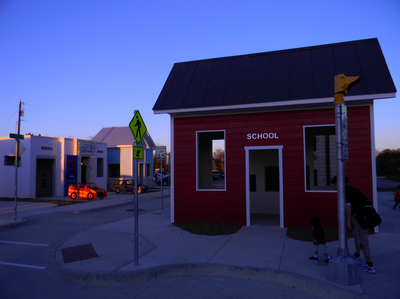 A photo of some of the buildings, streets and signs from the life skills village at the park.